I came across a cookie when I visited Portland a couple years back. It was a crackle-edged puddle of chocolate with a texture that made me think of a collision between soft meringue and a fudgy brownie. I kid you not, love is not too strong a word to use here. I fell hard for this cookie. Without getting too serious, I’ve been having an internal debate about whether or not I should post this recipe. When I post sweets or treats, I like them to have some sort of whole grain twist, or feature a natural sweetener. I mean, that’s usually how I cook and bake. But I have a big-time crush on this cookie, and I figured I’d post the recipe in all it’s powdered sugar, chocolaty glory in case some of you want to make a batch. In short, there are just six ingredients between you a baking sheet of these, no mixer necessary – just a big bowl and wooden spoon. As far as the origins of this recipe? I came across a recipe shortly after my return from Portland that sounded very close to the cookie I tasted there (they seemed to be a version of the François Payard’s Flourless Chocolate-Walnut Cookie), but the recipe I was working from didn’t work all that well for me. The good news is, it did provide a good starting point. I adjusted a few ingredients and my technique, and now I’ve been able to make them reliably. That being said, please read the head notes before making these, they have a few quirks that aren’t like other cookies – and I’ve outlined the exact ingredients I’ve tested and had success with. I think it’s best that we stop at eleven here 😉 This is my personal slushie list, inspired by some of my favorite cocktail maestros. Number one on my list. From Julia Turshen’s much-loved Small Victories cookbook, you know these are going to be hard to beat. Get the recipe here. Vodka + Limoncello + Lemon Sorbet + Prosecco – preferably enjoyed in the sun somewhere on the Italian coast. Get the recipe here. Have to admit, I’m intrigued by this one. Red cabbage is infused into boiling water to create blue simple syrup. When the acid in the lime juice hits it, color shift! I think it’s in the Tasty cookbook, and you can see it play out in the video. Get the recipe here. Fresh Mango and coconut milk, offset with orange and lime juices, and vodka. Get the recipe here. A case for swapping switching out your rosé habit. Some good guidelines and recommendations here. Recipes in right-hand column on this page. A go-to this summer. I love the refreshing cucumber, gin, and limoncello trifecta. Get the recipe here. A simple as it gets, in the best way – fruity white wine + frozen peaches. Get the recipe here. I always stock up on frozen cherries (because I’m usually too lazy to pit them). Pair those with a bottle of moscato and a spike of lime, and this is where you’re at. Get the recipe here. In addition to frozen cherries, I always stock up on frozen dragonfruit puree when I come across it. I can imagine a version of this using the puree being A+! Get the recipe here. The classic Negroni is equal parts gin, Campari, and sweet vermouth. Here it meets the blender and gets rounded out with fresh blood orange juice. Yes, please. Get the recipe here. Finishing strong. Literally. Smitten Kitchen meets Garden & Gun. This one looks a tad dangerous. Get the recipe here. Also, just in case you want to get serious and roll out your own slushie machine, you’re going to want to read this. Straight talk from the master: How to use a slushie machine. And, here’s a little tip sheet on Bon Appétit related to crafting your own frozen drinks. Lastly! I also love (and make a lot of) weeknight non-alcohol cocktails, let me know if you’d like me to do a list of those. Enjoy! The post Mexican Vegetable Rice Bowl appeared first on Food Heaven Made Easy. Some of these are definitely going to happen this week. My personal hit-list for peak tomato season. Crispy lettuce, heirloom tomatoes, crunchy cucumbers, toasted seeds, creamy cashew herb dressing, and a dusting of nutritional yeast. Get the recipe here. Inspired by time spent on Portugal’s south-west coast, a piquant tomato rice accented with fragrant saffron, garlic, smoked paprika, and bay. Photograph by Matt Russell for the Guardian. Get the recipe here. All things green in a quick, weeknight pasta option. It’s feel-good food that won’t weigh you down – ponzu dressing, green vegetables, and the pasta of your choice. Get the recipe here. I love Anna’s recipes (and style in general). As she says here, “…sticky roasted tomatoes, the soothing creaminess of coconut milk and sweet little white beans, topped with a crust of sourdough bread.” Yes, please. Get the recipe here. Genius take on gazpacho by Tara. My guess is you’ll do exactly what I did – click through and bookmark. To keep the toppings WFPB, just use a favorite non-dairy yogurt in place in place of the crema/cotija swirl, and a heart whole grain bread. Get the recipe here. This is a stove-top lasagna, which makes it perfect for hot summer nights. You’ve got ripe tomatoes, plus a summer bounty of corn, zucchini, and bell peppers. It’s all cooked in a skillet with pasta, topped with cashew ricotta and fresh basil. Sarah includes a GF option here as well. Get the recipe here. This is a beautiful riff on something along the lines of a tuna (or chicken) salad sandwich. Fecked with colorful tomatoes, carrots, peppers, arugula, and served on multi-grain, it’s one of the most inspired versions I’ve seen. Use a vegan mayo to keep it WFPB. Get the recipe here. A love-letter to summer (written in the depths of winter), Lindsay puts her spiralizer to work on the zucchini, rounds it out with whole wheat spaghetti, and tosses it all with a triple green avocado sauce. Burst tomatoes top it all off, and make this a perfect recipe to revisit right now. Skip the Parmesan to keep it WFPB/vegan. Get the recipe here. And as we round the corner from summer into fall, a riff on ribollita, using anything and everything I had on hand – all the chard in the crisper, plump white beans, potatoes, celery, the last of the last flat of summer tomatoes. Again, just skip the Parmesan to keep it WFPB/vegan. Get the recipe here. In the summer months, summer squash plays second fiddle to their zucchini cousin. It’s zucchini this and zucchini that but in reality, summer squash is just as good (and versatile in cooking!) One of my favorite summer recipes is this squash soup but the pesto bruschetta is a close second. This spiced squash salad is an older recipe but it’s a solid summer recipe. The squash soaks up the spice flavors and the tangy feta/lemon juice help round out the overall flavor of the salad. The post Spiced Summer Squash Salad with Chickpeas appeared first on Naturally Ella. The post Vegetable Collard Wraps with Peanut Sauce appeared first on Food Heaven Made Easy. I love cooked zucchini when done well. Grill it, roast it, or sauté it- there’s so many options. However, I often forget how great zucchini is raw, especially with herbs in a fresh summer recipe. These zucchini summer rolls really show this well. The zucchini is left in strips that are tossed in a wonderful herb mixture that’s finely minced and coats the zucchini/cabbage mixture. Perfect for a light lunch or road-trip snack. Also, I didn’t specify a sauce for these but a few different ones would work. Try a simple soy/rice vinegar/sesame mixture or step up your game with a tahini sauce. The flavors work well with many different kinds so find which type of sauce works best for you! The post Herbed Zucchini Summer Rolls appeared first on Naturally Ella. Want to Weave Millennial Pink into your Kitchen, Tabletop, and Photos? Here's how. I was shopping for plates the other night (for a photo shoot), and had a very specific idea of what I wanted – millennial pink, clean lines thick, modern rim. I wasn’t finding the plates I was after, but did come across quite a lot of blush amazingness. It occurred to me that posting some of my tabletop finds, along with a few musings on the topic might be interesting to some of you? Details styling, sourcing links, and the like…let’s give it a shot. Find the right pink. I’m sure most of you know what I’m referring to here, but for anyone who isn’t sure, millennial pink is that salmony-pink, blush, pale grapefruit pink you see everywhere now. There’s actually a single millennial pink in my mind, but you actually see products and designs in a range of pinks intending on hitting this mark. There’s a lot out there in millennial pink land, in quite a wide spectrum. I’m pretty specific about the shade range I prefer. The zone right around the Pantone Pale Dogwood shade is where it’s typically at for me – it’s not super saturated or bubblegum, and can function as a nice neutral in many ways. Avoiding the trend-trap. I think the key to incorporating a color like this into your kitchen, or table, and (correspondingly for many of us) photos, is usually to find individual pieces, or ingredients versus appliances, or anything installed or super permanent. I mean, there are certainly exceptions to this, but I tend to prefer to invest in a lot of neutral foundation elements, and then accent with whatever I’m enamored with at the time. Here’the the key, try to focus on picking up pieces that will age well, and will outlive any current trend. I love sourcing old or vintage pieces, so you end up with a very now color, but from fifty years back. Think beyond plates and products. The spectrum of color in food and individual ingredients is magic to me, and I love to work pale pink into my photos (and my meals) when it makes sense. There’s pink Himalayan sea salt, pale rose wines, herbal teas (for example, a weak hibiscus tea), blended strawberry almond milks, and raspberry oatmeals. So! Here’s a selection of items I came across the other night, in a range of prices, eras, design styles, etc. In addition to favorite shops, I like to haunt eBay and Etsy, and, in this case, searched using terms like – millennial pink tabletop, blush ceramics, vintage pink plate, pale pink textile, blush tablecloth. Some of my finds are one-of-a-kind, so anything is out of stock, search around! I suspect you can find so much more. The individual products are numbered in the graphics, with corresponding links just below. Continue reading Want to Weave Millennial Pink into your Kitchen, Tabletop, and Photos? Here’s how…. Just checking in quickly today to share a nice little apple breakfast recipe that we have been making a lot lately. We know that August hasn’t ended yet and we all want to hold on to summer for as long as we can and pretend that winter isn’t coming. But we thought we’d provide you with a little something for when the first chillier days arrive (which has already happened here btw) and you hear raindrops come knocking on your window sills. For those moments, you can just bust these baked apples out of the oven, let the scent of warm cinnamon spread through your home and immediately feel a little better about the whole situation. We have been making variations of this both as breakfast and dessert – filling them with oatmeal topped with yogurt for breakfast, and a date and almond paste topped with whipped cream for dessert. 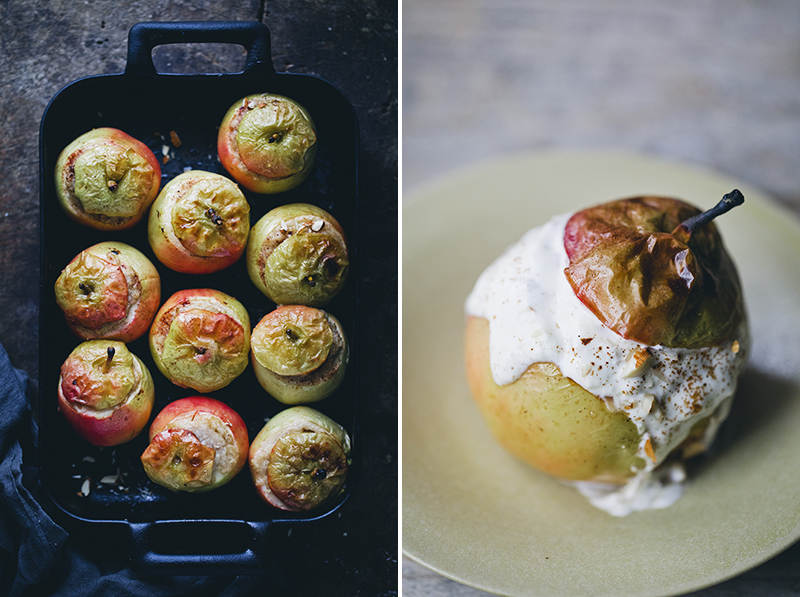 The idea to pimp regular oatmeal/porridge by stuffing it inside baked apples is pretty great in its simplicity. But here we make it a tad more special and extra delicious by cooking the oatmeal with pure apple juice/cider, spices, butter or coconut oil and chopped almonds for extra rich flavor and texture. 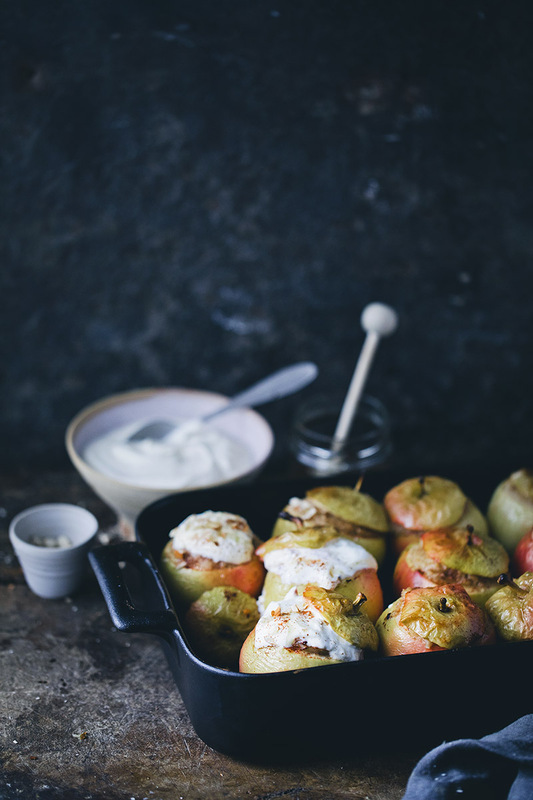 We then top the baked apples with a thick yogurt and drizzle with ginger honey for sweetness. And if you’ve got a little nut butter at home, that’s also good on top. Always use local apples if they are available and in season, they taste way better! I’d love to chat more, but it was my birthday yesterday and Luise surprised me with a dinner, sleepover and breakfast at Stedsans in the Woods. It’s a restaurant in the middle of the Swedish forest with great food, beduin tents, outdoor showers and a floating sauna. So we’re pretty eager to experience it. I’ll probably share a few snaps on my Instagram stories later tonight, if you want to check it out. We made this recipe with 10 apples because we wanted to make a large batch, but you can just as well make it for two or four people by reducing the amounts. Set the oven to 200°C / 400 °F. 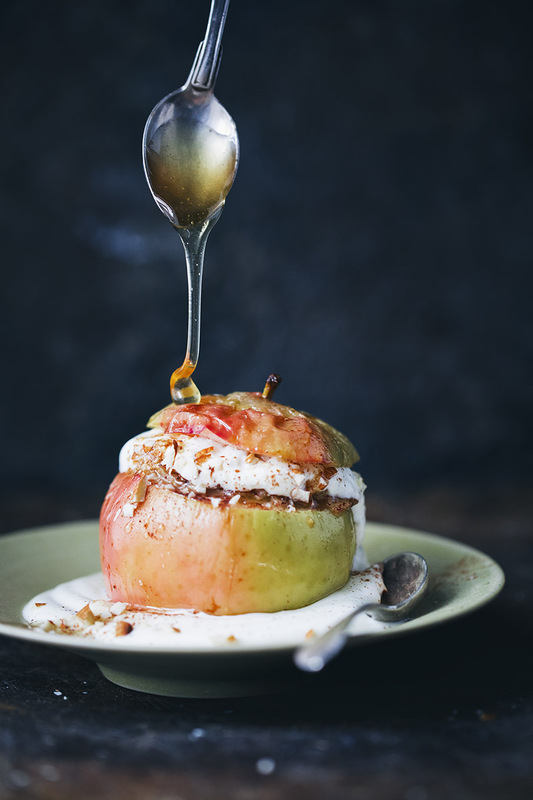 Prepare the apples by cutting off the top and then, using a sharp small knife or apple corer, scoop out the seeds and core in the center of each apple. Use a small spoon to scoop out enough apple flesh to make room for the porridge. 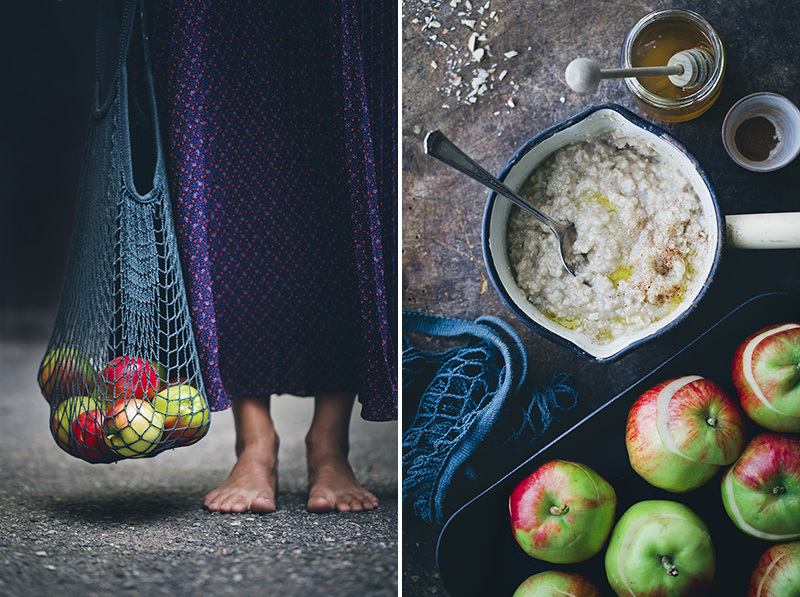 (The flesh can be chopped and mixed into the oatmeal before filling the apples). Rub the inside of the apples with a little lemon juice and place them in a baking tray with high sides. Add all the oatmeal ingredients except butter and to a medium sized sauce pan and bring to a boil while stirring. Lower the heat and cook until creamy. Stir in the butter (or coconut oil) and almonds towards the end and then fill the apples with the oatmeal, top with a pinch extra cinnamon and put the apple tops back on. Add 2 tbsp water to the bottom of the baking tray and bake for 25-30 minutes or until the apples are soft. 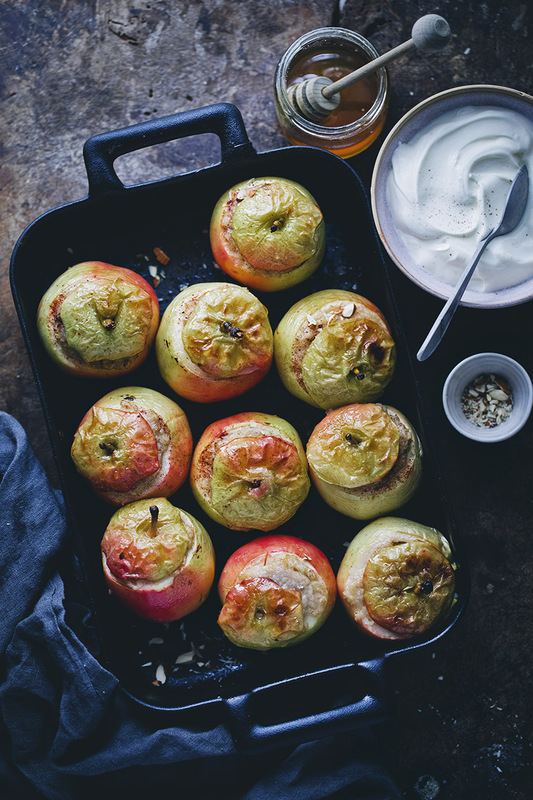 Keep an eye on the oven as different apple varieties need different baking time. 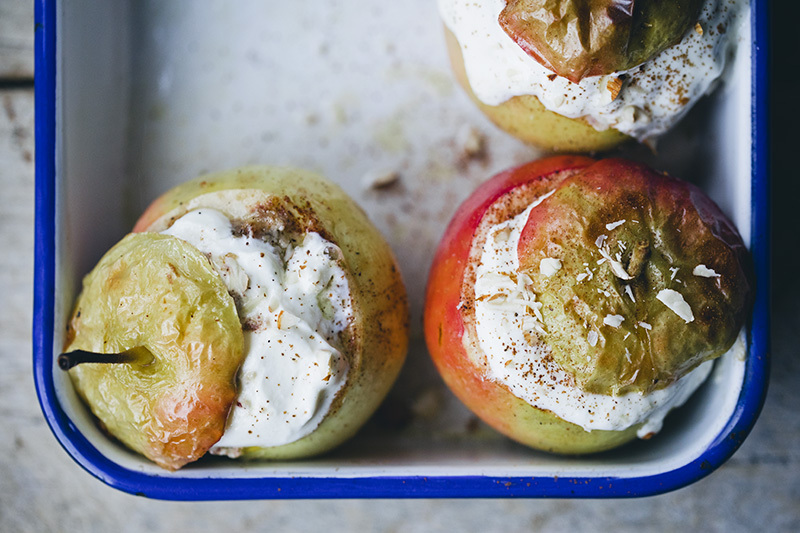 Serve the apples on a plate, topped with a dollop yogurt, chopped almonds, cinnamon and a drizzle of ginger honey. The post Black Lentil Enchiladas with Zucchini appeared first on Naturally Ella.